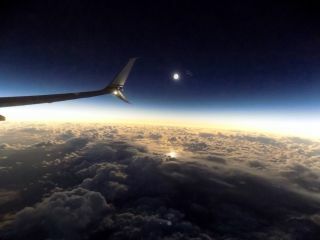 A view of the total solar eclipse of March 8, 2016, as seen by Space.com skywatching columnist Joe Rao and other passengers aboard Alaska Airlines Flight 870 from Alaska to Hawaii. The airline is also offering an eclipse-viewing flight on Aug. 21, 2017. NEW YORK — On a midsummer night's eve, veteran meteorologist and Space.com skywatching columnist Joe Rao led a sold-out show at the Hayden Planetarium for its "Astronomy Live: Stars of Summer" Program on Tuesday, July 25, where he turned his expertise to the upcoming total solar eclipse. A longtime educator at the American Museum of Natural History in New York, Rao spoke enthusiastically at the adjacent Hayden Planetarium about why folks across the country should do their best to view the Aug. 21 solar eclipse, calling it "one of the events of the century." 2017 Solar Eclipse with Joe Rao from Michael Kozel on Vimeo. According to Rao, viewing the rare spectacle is akin to watching a Broadway theater's lights dimming before the drama begins: The excitement kicks in as one feels the temperature change and the birds quiet down. He said that a viewer will leave feeling so engrossed in every moment of a total solar eclipse that they feel like it passes in just seconds, although it lasts a few minutes. People in parts of Africa, South America and Europe will be able to see at least a partial eclipse in August, and about 220 million people will be within an hour's drive of the moon's dark conical shadow as it moves across the United States, Rao said. The path of totality will average about 100 miles (161 kilometers) in width, and 12 million people are already living within the "fortuitous" path of the eclipse, he said. This picture of the Aug. 11, 1999, solar eclipse was one of the last ever taken from the Mir space station. It was used in Joe Rao's "Summer Nights" Hayden Planetarium event on July 25 2017 in New York. Rao emphasized these numbers to encourage the audience to plan for traffic during their travels leading up to and after Aug. 21. According to an old news article Rao shared during the program, people have been waiting for this eclipse since as far back as 1932. Rao advised the delighted audience to pay special attention to Interstates 5 and 85, the latter of which takes you out of Atlanta. This is a major city sitting just outside the path of totality, so he warned that its associated interstate is likely to suffer large traffic jams in the days preceding the eclipse. Whether they'll be viewing a partial or total eclipse, Rao said there will be approximately 600 million people looking skyward on Aug. 21 across the world. He described some do-it-yourself methods that guests could share with their loved ones if they did not have eclipse-viewing glasses and found themselves looking for last-minute eclipse-viewing solutions. For instance, he advised using welder's glass No. 13 or No. 14, which is available at most hardware stores. Another safe option is to look at tree leaves, since the sun will cast crescent-shaped shadows on foliage. Rao warned people to under no circumstances look directly at the sun. According to Rao, there are no pain sensors in the eye's retina, so someone could be burning their eyes without noticing.Whether they'll be viewing a partial or total eclipse, Rao said there will be approximately 600 million people looking skyward on Aug. 21 across the world. He described some do-it-yourself methods that guests could share with their loved ones if they did not have eclipse-viewing glasses and found themselves looking for last-minute eclipse-viewing solutions. Having himself traveled to various solar eclipse sites throughout the years, Rao said he's "very happy to file [his] celestial reports" for all to enjoy and learn from.